Dandelion (Taraxacum officinale F.H. Wigg.) is a cool-season, perennial broadleaf weed common throughout Louisiana. It can spread through seed and through root fragments. The weed produces bright yellow flowers, which are typically observed beginning in the spring. Dandelion has a thick, deep taproot that allows it to thrive in turfgrass, especially in areas where turfgrass is weak. Dandelion has long, narrow, deeply lobed leaves that form a rosette at the base of the plant. Leaves are typically green but can be purple toward the base. Single yellow flowers emerge from the center of the rosette on long, hollow stalks. As a flower matures, seeds — each with a tuft of hairs — form a spherical “puff ball” on the flower stalk. The hairs on the seed allow the seeds to be carried away by the wind. Both the leaves and the flower stalks exude a milky sap when broken. 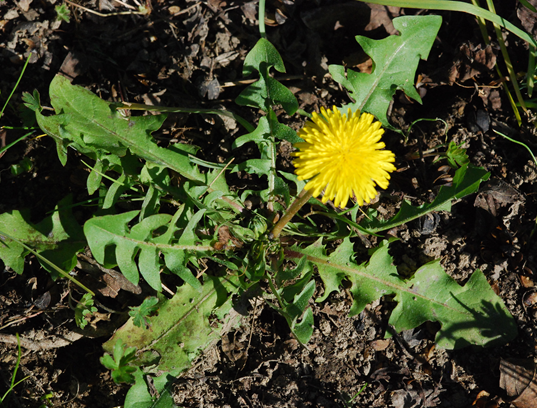 For more information on dandelion identification and characterization, visit the USDA Plants Database at https://plants.usda.gov. The best way to prevent or reduce weed encroachment is to maintain a healthy lawn through proper fertilization and soil pH and regular mowing. Properly maintaining a lawn through these cultural practices promotes dense and vigorous turfgrass, allowing it to better compete with weeds. Below are the recommended mowing heights and nitrogen fertility rates recommended for each turfgrass species. In addition to these lawn care practices, manual removal of weeds may also be necessary. In addition to cultural practices, herbicide applications may be required to achieve effective weed control. Dandelion is a perennial broadleaf weed that is readily controlled by post-emergence herbicides, especially those containing 2,4-D.